Amigurumi Cthulhu! Evil incarnate...! Or not? 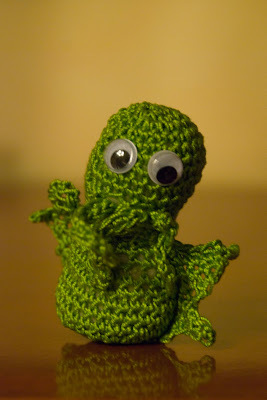 If you don't know who Cthulhu is, check wikipedia. I made the body, head and eye-gluing, Laia did the tentacles, wings and sewing. This came after buying this book (Amazon link) at FNAC. Now she is addicted...She browses for more templates as I write this post.